Aquassure is a preferred supplier to MEDIchair, Harding Medical and Motion Specialties Home Medical Equipment Retailers (HME), along with many other HME locations. Aquassure is an authorized distributor of Best Bath walk-in tubs and barrier-free shower products. Aquassure is accredited by the Better Business Bureau. 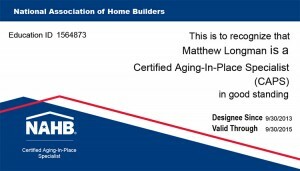 Matthew Longman a Certified Aging-in-Place Specialist (CAPS) through the National Association of Home Builders. Aquassure bathtubs are certified by the International Association of Plumbing and Mechanical Officials.